Ubuntu has helped spawn umpteen Linux distributions. 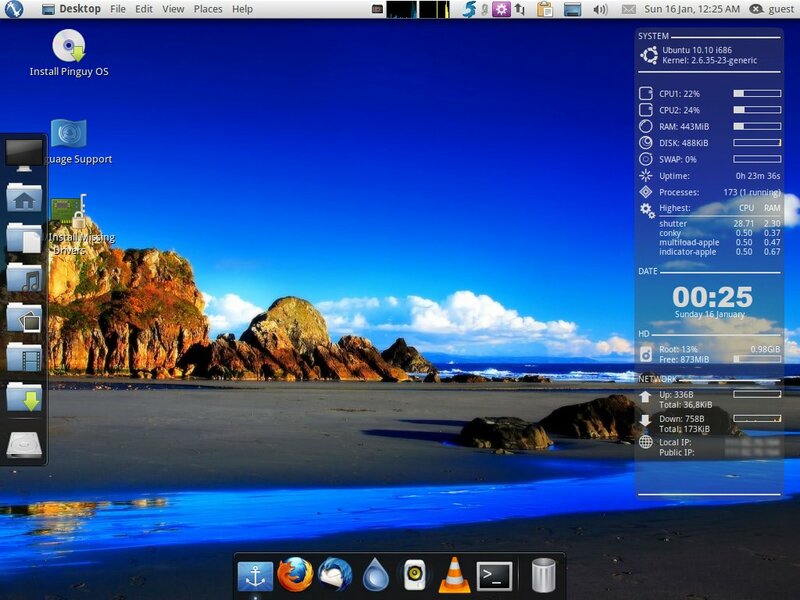 Pinguy OS is yet another Linux distribution based on Ubuntu (version 10.10 to be exact). Pinguy OS is targeted at lay persons - people who are going to use Linux for the first time, or those who want an out-of-box working OS. It is currently available to download as a DVD ISO (~1.3 GB size) for the 32 and 64 bit architecture PCs. I was visibly impressed with the screenshots of Pinguy OS desktop I chanced at various places on the Net that, I decided to download this Linux distribution (essentially built from Ubuntu Minimal CD) and take it for a spin. I tried out Pinguy OS on my two year old PC which has Intel Core 2 Duo processor, 2 GB RAM, 128 MB onboard Graphics memory, and a 320 GB hard disk. Put in one word - Fabulous! The Pinguy OS Desktop is awesome. Clearly, a lot of work has gone into building this distribution. When you first boot into the LiveDVD, you are presented with the super tweaked GNOME desktop in all its glory. Compiz is the default window manager. However, if your machine is not powerful enough, the Desktop falls back to the fail-safe mode by disabling many special effects. Software - Lots of it! Pinguy OS comes with a plethora of software for almost any task you may wish to do using your computer. Each software that is included in Pinguy OS is choosen carefully. A lot of software which is aimed to enhance the user experience has made its way into the Pinguy OS distribution. The notable ones being Gloobus Preview, Cover Gloobus, Cover Thumbnailer, Global Menu (which turns the GNOME top panel into a dynamic 'Apple Mac OS X' style menu for applications), Conky (which displays live system stats on the Desktop), Docky (That provides a Mac OS X style panel), and GNOME Do. Another interesting utility that I found in Pinguy OS is the Webbilder applet. This applet downloads popular photos from online photo sharing sites - Webshots and Flickr; and sets them as the wallpaper on your Desktop. The Graphics tool collection is quite modest and GIMP hasn't made into the Pinguy OS graphics selection. However, Pinguy OS comes with another graphics editing tool called Pinta which is a decendent of Paint.NET. There are two tools for photo management namely Rapid Photo Downloader and Shotwell. And for taking screenshots, you have Shutter which can be favourably compared to the professionally used Techsmith product SnagIT. 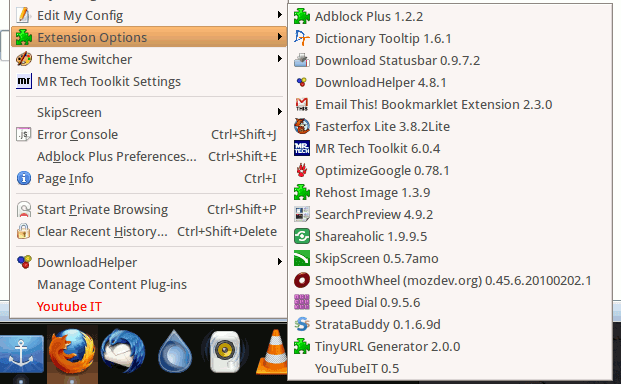 Firefox (3.6) - the defacto standard for Web browsing - is the default web browser in Pinguy OS. However, the developers have gone one step further in including over a dozen useful extensions in Firefox - which is really thoughtful. Other changes compared to Ubuntu are - Bittorent client Deluge replaces Transmission. Email client Thunderbird takes the place of Evolution. XChat is included as well. A notable feature of Pinguy OS is the inclusion of two popular, closed source albeit free software namely - Skype and Dropbox client. Fostwire which is a peer to peer program used to share files with others has also been included. Pinguy OS does not ship with any games. However, it comes with a wonderful application (software manager) called "PlayOnLinux". The first time you start "PlayOnLinux", it's wizard will start downloading updates. Once that is done, "PlayOnLinux" will present a collection of games (proprietary and otherwise). The collection is quite good. On the system side, Oracle VirtualBox is installed. Apart from that, Pinguy OS also comes with a dedicated backup tool in Dejapup; Wine and Winegame for installing Windows software and games; Ubuntu Tweak and Ailurus which allows you to tweak all the aspects of the Desktop and more. Ubuntu by default ships with a firewall called ufw. However, it is disabled by default. And because it is a command line tool, ordinary users may not be aware of it. Pinguy OS has included a GUI front-end for ufw called Gufw which makes it much easier to enable the ufw firewall and use it. Then there is Bum (Boot Up Manager) which is a graphical front-end to configure run-levels and start up services, which is also included in Pinguy OS. 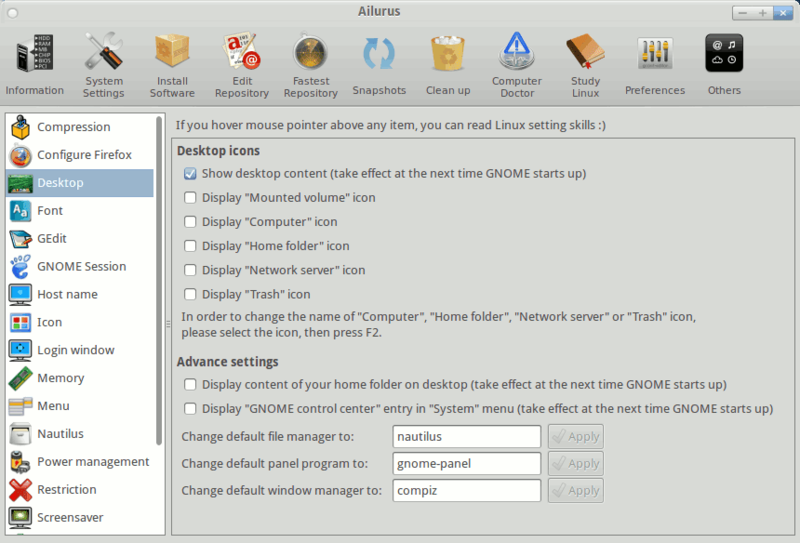 Gnome Activity Journal is another software which caught my fancy in Pinguy OS. Gnome Activity Journal is powered by Zeitgeist and provides a time line of all the files you have accessed in the past. This is another area where Pinguy OS shines quite well. I was able to play music and movies in almost all the audio and video formats. Anybody with a TV card that wants to watch tv on their PC will be able to do so in Pinguy OS. Some of the notable software in this section found in Pinguy OS are - Brasero and DeVeDe for burning CDs DVDs and BlueRay disks; HandBrake - a DVD transcoder, MPlayer, VLC Media player, Open Shot video editor which allows you to open and edit movies ... just to name a few. The amount of finetuning that has gone into this project is quite amazing. For instance, when I press the print screen key, Shutter pops up and takes a screenshot instead of the elementary screenshot tool found in GNOME. Conky has been spruced up with a custom configuration file which makes it a joy to display on the Desktop. The special effects are vivid without being garish. All the multimedia codecs are there. So is Oracle Java and Adobe Flash player. Pinguy OS also helps reduce your carbon footprint because it runs Granola in the background. 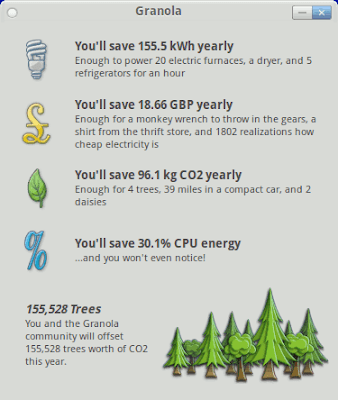 Granola is a free tool that helps reduce the power consumption of your computer without affecting its performance. 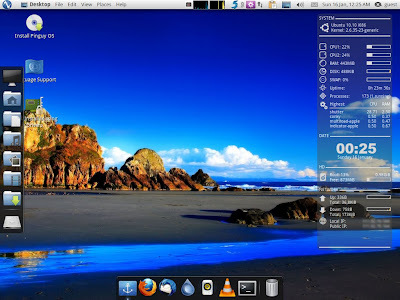 Pinguy OS is indeed an amazing work and a true user friendly Linux distribution. But that doesn't mean I didn't find any glitches (minor ones really). And this post won't be a complete review if I didn't write about it. There was a mismatch in some of keys on my keyboard. For instance, when I pressed the "|" key, I got a tilde (~) on the screen. This is because Pinguy OS uses a default keyboard layout for United Kingdom instead of USA. Changing the keyboard layout to "USA" solved this problem. Atleast when running the liveDVD, Conky overlaps all opened applications. Restarting Conky solved this problem as well. There is no e-book reader which could read ePUB and MOBI files. One such as FBReader would have been a nice fit. I found some applications which were too similar in their purpose. For instance, Shotwell and Rapid Music Downloader are photo management programs and does more or less the same stuff. I prefer Shotwell over the latter because the latest version 0.8 of Shotwell has support for videos, including uploading videos to social video sites such as YouTube. Similarly, I found 3 different movie players. I do agree that variety is the spice of life but ... too much variety could overwhelm the users as well. Call me old fashioned if you will, but I feel GIMP is a superior graphics editor than Pinta. Including GIMP would have made the Graphics package more complete in Pinguy OS. Of course you can always install GIMP from Synaptic package manager on your own. But then that defeats the USP of Pinguy OS namely - "an out-of-the-box working OS without doing all the tweaks and enhancements". What does the future hold for Pinguy OS ? Considering that Ubuntu 11.04 is all set to move towards Unity and GNOME Shell, and because Pinguy OS is based on Ubuntu, one wonders what is in store for this really cool Ubuntu cousin. I have no plans to use Gnome Shell or Unity for 11.04. Pinguy OS 11.04 desktop will stay mostly unchanged to how it is now. Pinguy will follow the Ubuntu 6-month release schedule but will be released a few months after the finale release. This will never be more then two months. One change that is being thought about is replacing Rhythmbox with Clementine. This is all depending on how polished Clementine is by time 11.04 comes out. In this lengthy review, I have just scratched the surface of what Pinguy OS has to offer. What I really like about Pinguy OS is the amount of work that has gone into making it a truly user friendly Linux experience. Anyone who uses Pinguy OS will fall in love with Linux. Period.